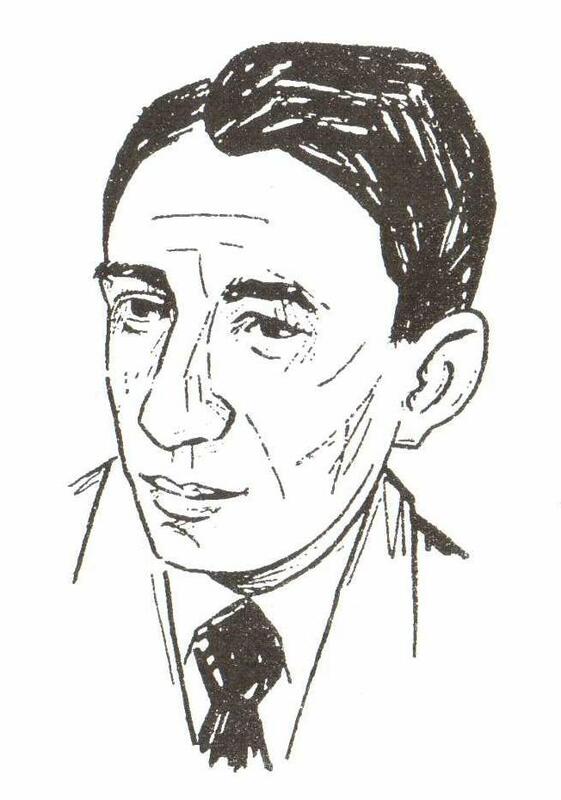 International competition dedicated to the 100th anniversary of birthday Vasily Sokov – Final of World Cup in draughts-64 ended. 51 players from Russia, China, Ukraine and Estonia took part in competitions. Belosheyev Sergey (Evpatoria, Ukraine) took 1st place, Skrabov Vladimir (Yaroslavl, Russia) took 2nd place and Melnikov Dmitry (St. Petersburg, Russia) took 3rd place. See results, parties and team standing. Best results: participant of the 1st World Mind Sports Games (SportAccord 2011) among men and 2nd World Mind Sports Games (IMSA 2012) among women. Champion of China among men (2011) and among women (2012). Liu Pei was the best among women. 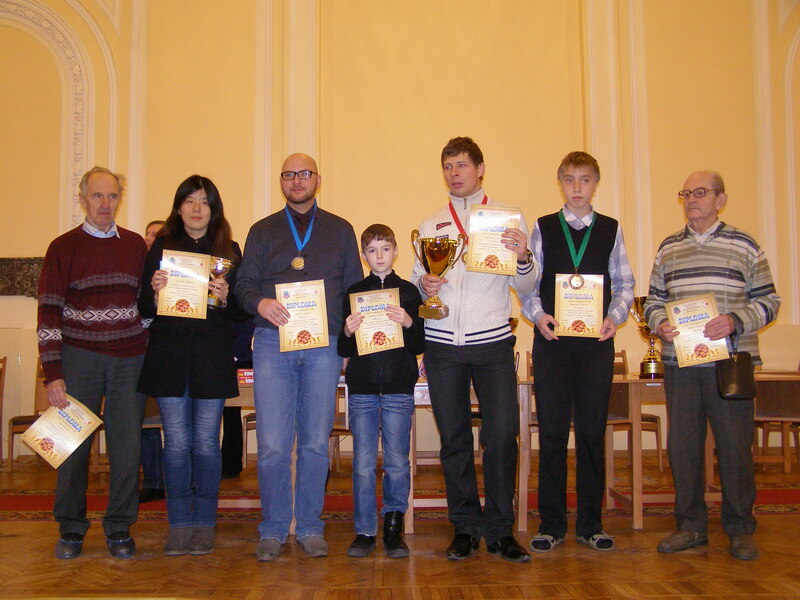 Best results: European Champion among mini-cadets, Prize-winner of Russian Youth Championship among boys 13 years and younger. He goes to school with intensive study of the English language. 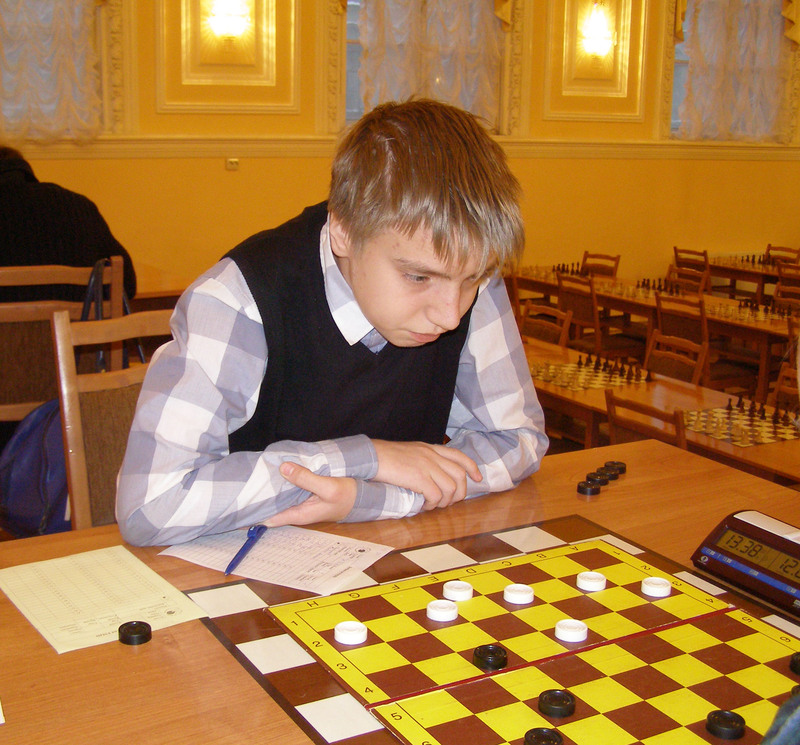 Dmitry showed very good results in this tournament and performed the norm of National Master. Belosheyev Sergey lead in the World Cup after 8 rounds with a score of 14 points out of 16. 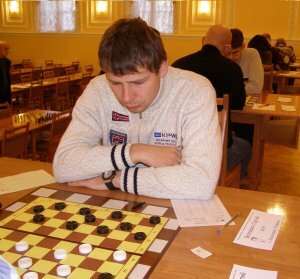 Vladimir Skrabov is in second position with a score of 13 points out of 16. Best results: European Champion in draughts-64 (2007, Blitz), prize-winner of the 1st World Mind Sports Games (SportAccord 2011), multiple Champion of Russia. Job: President of Draughts Federation of Yaroslavl region, coach. Belosheyev Sergey lead in the World Cup after 7 rounds with a score of 12 points out of 14. 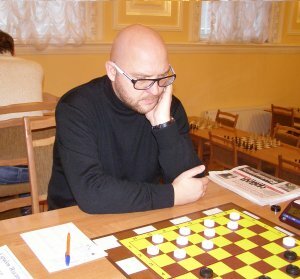 The Section-64 FMJD in accordance with the calendar of the Section-64 competitions in 2012 from 09 December (day of arrival) to 17 December (departure day) in St. Petersburg (Russia) holds international competition dedicated to the 100th anniversary of birthday Vasily Sokov – Final of World Cup in draughts-64. 2. The place and time of the competition. St. Petersburg, Bolshaya Koniushennaya, 25 (metro station “Gostinny Dvor”, facing Canal of Griboyedov) from 09 December (day of arrival) to 17 December (departure day) 2012. 3. Leaders of the competition. 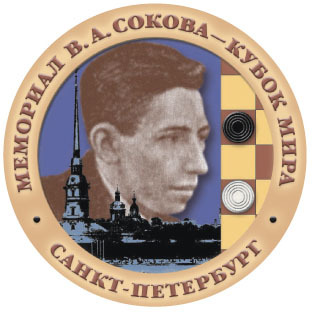 General management, organization and carrying out of competitions are held by the Section-64 FMJD – International Draughts Federation IDF and Draughts Federation of Saint Petersburg. Direct responsibility of the holding of the competition rest with the panel of referees, approved by Section-64 FMJD – International Draughts Federation IDF. 2. Youth competitions in draughts-64 – for boys and girls (with offset by age group). In the youth tournaments provided team standings. Team: 3 boys and 1 girl. The participation in the competition among men and women is allowed for the players who have rank not lower than “Candidate of Master”, in the youth competitions – players born no later than 1996, who paid the entrance fee and registered in accordance with this regulation time. The number of participants representing the country is not limited. 6. The conditions of the competition. Competitions are held according to the rules of Section-64 FMJD. The system of competition is Swiss. Final of World Cup held in Russian version of draughts 64 by the system of micro-matches consist of two games with the draw of the initial moves and positions, required in both parties of micro-match. Youth competitions are held in the classic draughts 64. Final of World Cup – 45 minutes to each participant before the end of the party, plus 10 seconds per move. In the youth competitions – 1 hour to each participant before the end of the party. Places of participants are determined by the biggest amount of points. In the team classification by the largest amount of points scored by all team members. In case the same result of two or more participants, the additional criteria established by the panel of referees in accordance with the rules of the FMJD. 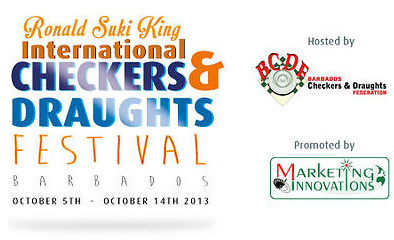 Participants who took 1st place in each tournament will be awarded with cups and diplomas. Participants who took 2-3 places in each tournament will be awarded with diplomas. The team, which has won 1st place awarded with cup and diplomas, participants with diplomas. Teams placing 2-3 places and it’s participants are awarded with diplomas. The prize fund of Final of World Cup is 80% of the collected fees. Participant who took the 1st place in the overall World Cup is awarded with cup, a medal and diploma. Participants who took 2-3 places in the overall World Cup are awarded with medals and diplomas. The prize fund of the World Cup in 2012 is formed according to the Regulations of the World Cup. Participants are required to attend the awards ceremony; otherwise they lose their official awards. The organizers will provide accommodation winners of five previous stages of the World Cup. The costs of their travel, meals, payment the entry fee and the cost of sending the other participants by sending organizations. In the Final of World Cup – 1000 rubles for each participant. In youth competitions – 600 rubles for each participant.